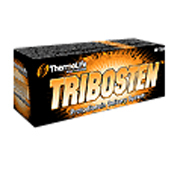 Tribosten – Protodioscin Delivery System has taken over as the worlds # 1 tribulus terrestris product. ThermoLife International's research and development team has worked directly with the first and only American scientists to separate pure protodioscin from the tribulus terrestris plant. Previously, this technology was only known to a handful of Bulgarian scientists who kept this secret under lock and key. This new technology has enabled ThermoLife International to produce Tribosten, a superior tribulus terrestris product with a higher percentage of protodioscin than anything else ever available before. This is important because protodioscin is the active ingredient in tribulus terrestris that is responsible for stimulating the Luteinizing Hormone and ultimately raising testosterone levels (naturally). This combined with Bioperine, a patented extract for increasing bio-availability of oral supplements guarantees you the finest tribulus product your money can buy and the only Protodioscin Delivery System available. As a dietary supplement take one (1) to two (2) tablets three (3) times per day with meals. Tribosten is shipped in a discrete, unmarked package. Orders are processed immediately and usually take about 3 to 5 working days to be received. We do ask that you try it for 2 to 3 weeks to feel the full effects. Any information received is used only for order processing and shipping purposes. Your information, such as e-amail address, will never be disclosed to a third party.